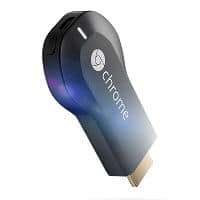 Google’s Chromecast media streamer, which enables users to send shows, movies, music and more to large screens, is to use a new ultrasonic connectivity technology to enable mobile devices to be paired with a Chromecast-equipped television, GigaOm reports. “The new pairing feature will enable users to cast their content even if their phone is connected to a mobile network,” GigaOm says. “To enable this, Chromecast owners have to first allow support for nearby devices. After that, any user in the vicinity of a Chromecast can request from within any cast-enabled app. The Chromecast streaming stick then plays a unique ultrasonic sound through the TV’s loudspeakers. Currently, devices that want to pair with a Chromecast first need to be connected to the same WiFi network.